QUITO, Ecuador (CNS) — Catholics will never be effective evangelizers if they are squabbling among themselves, and they cannot show the world how faith in Christ responds to the human yearning for freedom and peace if they are divided, Pope Francis said. 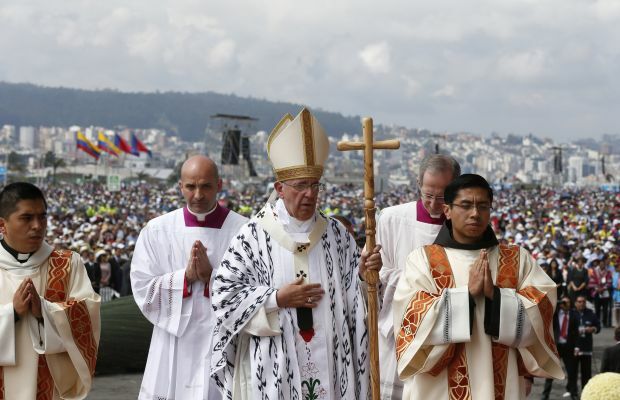 The pope’s Mass July 7 at Quito’s Bicentennial Park was billed as a Mass for evangelization, but the pope insisted Christians would convince no one of the power of the Gospel if they could not demonstrate in their lives and behaviors that faith pushes a person beyond self-interest to concern for others. Christians do not look at the world through rose-colored glasses, the pope said, but they can dream. Like Jesus, they see the world’s flaws, but also like Jesus, they love the world God created. “It is precisely into this troubled world that Jesus sends us,” he said. “We must not pretend not to see or claim we do not have the needed resources or that the problems are too big. “Instead we must respond by taking up the cry of Jesus and accepting the grace and challenge of being builders of unity,” he said. Local church officials said more than 800,000 people gathered at the park, a former airport, for the Mass. Ecuador is the world’s third-largest exporter of cut flowers and roses are queen — a fact evident from the rose petals strewn along the pope’s path, the flower-petal carpets on the altar platform and the colorful arrangements that decorated even the walkway to the makeshift sacristy behind the stage. The congregation gathered for the Mass was just as varied; members of different indigenous groups and visitors from other South American countries risked a forecast of rain to pray with each other and with the pope. Pope Francis wore a chasuble with an indigenous design, and the second reading at the Mass was in the Kichwa language. Margarita Maria Jaramillo Escobar, 58, came with a group of 80 people from Medellin, Colombia, to pray with the pope. Those who gather around the altar and share Communion should be united with one another, setting aside worldly desires for power and petty squabbles in order to show the world the peace and unity that comes with faith in Christ, Pope Francis told them. Because of sin, he said, unity takes real effort. It requires a commitment to explicitly trying to include everyone, to avoid selfishness, to promote dialogue and encourage collaboration. Society needs people committed to unity, the pope said, and so does the church. “Jesus consecrates us so that we can encounter him personally. And this encounter leads us, in turn, to encounter others, to become involved with the world and to develop a passion for evangelization,” he said. “Communion, communication, self-giving and love” are the hallmarks of a Christian vocation, he said, and they are what makes it possible to take diversity and differences and turn them into a richness. Unity is not “something we can fashion as we will, setting conditions, choosing who can belong and who cannot,” he said. “This ‘religiosity of the elite’ is not what Jesus proposes.” Recognizing God as one’s father means recognizing all his children as brothers and sisters, he said. Contributing to this story was Barbara Fraser in Quito.